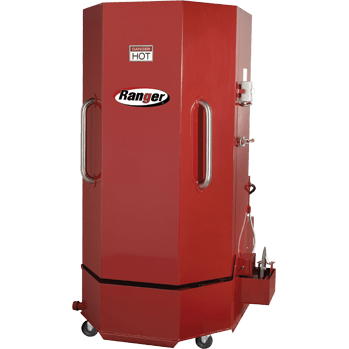 Only Ranger delivers deep-down auto parts cleaning with a solid line of heated aqueous spray parts washers designed for durability and precision under the most demanding conditions. Let’s face it; people in our line of work aren’t generally too concerned about a little dirt, but when it comes to grimy parts in desperate need of cleaning, that’s precisely where we at Ranger shine. Close and latch the door then set the wash-cycle timer for up to 60-minutes. As the turntable rotates at 3-RPM, the parts are blasted from all angles with hot soap and water. The solution is continuously filtered and recycled. Each of our best-in-class industrial parts washers and parts cleaning systems are designed to hold payloads of 500 to 1,000 pounds which means they’ll tackle big stuff like complete transmissions, engine blocks and more with ease. But we’d never stop there. A Ranger parts washer boasts more convenient features than any other industrial spray cabinet on the market today. Where others might consider these details to be luxury extras, at Ranger we know that they are essential to hard-working professionals like you. That’s why each Rangerparts washer cabinet comes with a heavy-duty turntable, high-quality replaceable brass nozzles, an automatic timer, safety door switch, heavy-duty parts cleaning basket, a removable tree rack, tank drain, heavy-duty casters, multi-directional spray jets and a built-in oil skimming system. On top of that, we even throw in a 25-gallon bucket of Aluma-Klean premium parts cleaning detergent absolutely free. While we take a little grease as a point of pride, your clients will certainly appreciate the immaculate cleaning results brought to them exclusively by a Ranger parts washer spray system. Browse and compare these Parts Washers by Ranger and soap options with the handy slider at top of the page, or click on another product section using the navigation bar to see something completely different. RS-500 500 lbs. 50 gal. 32" 43"
RS-750 1,000 lbs. 53 gal. 54" 32"
Ranger™ front-loading parts washers are fully integrated commercial parts washing systems for auto repair shops, manufacturers and other industrial parts cleaning applications. Our automatic parts washing systems help your business run smoothly and safely, protecting the work environment by using heated aqueous technology combined with a water-soluble detergent solution. No hazardous solvents are used in our cleaning procedures. Technicians simply load dirty parts into their Ranger parts washer, turn a knob and walk away. It’s that simple. In no time, those once filthy parts are grime-free and ready to go. No harmful solvents, no laborious brushing or cleaning by hand. Ranger parts washers are generally used to clean transmissions, engines and engine parts, industrial machinery, brake drums, wheels, or other parts in desperate need of a bath. Ranger high-pressure parts washers clean by using a combination of high pressure, multi-directional spray nozzles and heated aqueous-based detergent solution. Alloy spray nozzles positioned along the interior wall, ceiling and underside of the cabinet and turntable spray heated, high-pressure streams of cleaning solution at the objects loaded inside the massive front-loading cabinet. A low RPM turntable provides 360-degree cleaning. All Ranger industrial parts washers have a built-in purifying/recycling system that enables the detergent solution to be reused many times over, which minimizes operating expenses. The system works by skimming oil from the solution and discharging sludge into a separate disposal container. Ranger’s disk skimmers feature a parallel shaft gear motor that is sealed and rated for continuous operation. A stainless steel disk eliminates warping typically associated with plastic discs. The skimmer features a deep sump collection reservoir, stainless steel wiper blades and a steel trough that directs used oil and contaminants to a collection container. To maintain solution purity and cleaning performance, a large debris filter screen is used to remove larger particulate before it enters the solution tank. These integrated systems enable the user to reuse the detergent solution several times before requiring a refill. Because the detergent solution is water-based, the final batch of solution can be evaporated or drained. Left behind are grease and other sludgy materials within the tank for proper EPA disposal. When searching for a commercial-grade automotive parts cleaning system, businesses should evaluate equipment models and detergent types to best suit their needs. Always start by determining the weight and size capacity needed for today’s demands, as well as tomorrow needs. The right parts washer minimizes running expenses. It is also clean, safe, efficient and convenient to operate. By first researching regulatory responsibilities, businesses can avoid costly investigation and compliance problems down the road. Even when using commercial parts washers like Ranger's aqueous systems, testing and approval from wastewater treatment agencies is required prior to disposing left-behind waste. Before deciding on a parts washing system, be sure you fully understand the regulatory advantages and disadvantages of each washer type. 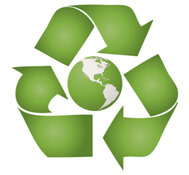 Unless an official evaluation deems the waste non-hazardous, whether aqueous or petroleum-based, parts washer solution and waste must be managed as a hazardous disposal. Waste evaluation may consist of a chemical ingredients declaration and full disclosure of the contaminants introduced to the cleaning solutions. Sometimes, additional testing is required. If your parts cleaner service or supplier does not address regulatory concerns that apply to your parts washer, consult with your hazardous waste regulatory program for assistance. Failure to gain the necessary approvals prior to disposal of parts cleaning wastes can result in enforcement action and other liabilities. There are several different parts washing systems on the market, ranging from simple bench style cleaning tanks, to sophisticated free-standing front-loading cabinet styles. Determine which system is best for your shop based on the type and quantity of parts that are routinely cleaned, as well as the type and amount of grime that will be present. Water-based detergent solutions found in aqueous parts washers are typically less hazardous to users and those in close proximity to the work area than petroleum-based types. Water-based parts washers like the Ranger RS-500 or RS-750 typically use a powder or liquid detergent that includes a corrosive ingredient, such as alkaline, as well as other less corrosive chemicals to remove soil, grease and grime from parts. Petroleum-based parts cleaning systems use petroleum-based solvents such as mineral spirits, Stoddard or kerosene. Though mineral-based solvents are effective cleaning agents, they have been banned in many areas because they give off Volatile Organic Compounds (VOCs). VOCs are a major cause of urban air pollution, and many contain compounds that are toxic and have health risks associated with long-term exposure. Long-term exposure to these concentrated vapors can cause coughing, choking, inflammation of the nose, throat and upper respiratory tract. In severe cases, they can cause pulmonary edema, circulatory failure and death. Because petroleum-based solvents are ignitable, shops using these volatile cleaners must take extra precaution when using and storing the solution, and managing the waste. By comparison, Ranger’s water-based aqueous cleaning solution has very low VOC ratings, making it a better choice than solvents in areas with air quality concerns. Our Aluma-Klean water-based powdered detergent is also nontoxic, nonhazardous and nonflammable. Contaminants in the water are removed mechanically with our built-in oil skimming system, or concentrated by evaporating away most of the water. Like any industrial parts washing system, the cleaning solution has to be monitored and maintained for optimum cleaning performance. This means adding make-up water periodically, monitoring the concentration of the cleaning solution, and using the skimmer and remove large particulates form the filter screen. Petroleum-based cleaning systems have declined dramatically in recent years due to stricter regulatory demands. From a risk perspective, more and more workplaces are choosing water-based cleaning systems. See the material data safety sheet on Ranger's Aluma-Klean recirculating detergent. Regardless of what kind of engine or transmission work you do, pre-cleaning the parts is almost always first on the list. 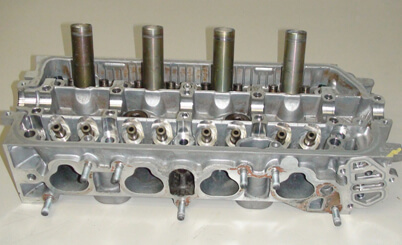 Parts should be cleaned before they are reassembled, repaired or machined for a variety of reasons: it helps maintain a clean work environment; cleaning uncovers bare metal surfaces, making hairline cracks and other flaws more visible; it creates a clean surface that can be painted or coated later. 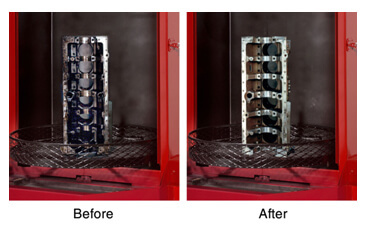 Thorough cleaning is also one of the last steps you should consider after parts have been machined or resurfaced. Although initial cleaning will remove any accumulated grime, the second cleaning will remove any remnant cutting lubricants or metal chips/grinding debris. 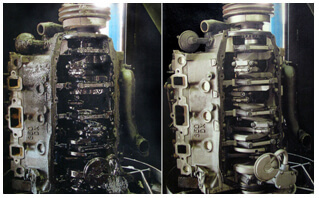 Final cleaning is always important because debris not washed away can end up inside the engine or transmission. From a business perspective, cleaning costs need to be fully understood and calculated. The labor and expense that goes into cleaning can account for 10 percent or more of the total cost to rebuild an engine or transmission. In some shops, parts cleaning may account for as much as 30 percent when you factor in time, labor, the cost of equipment, chemicals and waste disposal. Compared to shops specializing in performance work on racing engines with mostly new parts, cleaning represents a higher expense for those shops specializing in older engine or transmission repair, due to years of accumulated debris. Whether you’re removing years of accumulated grime or just washing parts for that factory fresh look, every engine and transmission builder needs to periodically review the cleaning process to make sure procedures are working well. 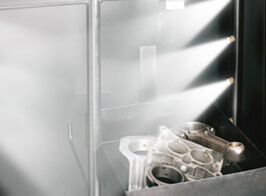 One of the hidden costs of cleaning engine parts, transmission parts or other machinery components is the disposal of used chemicals and other waste that is leftover from the cleaning process. With any type of aqueous cleaning system, sludge and oils inside the tank or parts washer cabinet have to be filtered, skimmed or removed as prescribed and mandated by regulatory agencies. According to Resource Conservation and Recovery Act (RCRA) regulations, a substance is classified as waste when it is no longer a usable product. A barrel of caustic or a drum of degreasing solvent is not considered waste as long as it is still being used to clean parts (or is being stored for future use). Once a cleaning product becomes contaminated with sludge and is removed from the cleaning equipment, it becomes "waste" and may be subject to hazardous waste storage and disposal regulations if it contains ingredients that make it hazardous. Corrosives, such as strong acids (phosphoric, hydrochloric, etc.) or caustics (sodium hydroxide) that have not been neutralized. This would be determined by measuring the pH of the liquid. Toxic or poisonous chemicals (most petroleum distillates & solvents). Organic solvents or chlorinated hydrocarbons (such as methylene chloride or carbon tetrachloride). 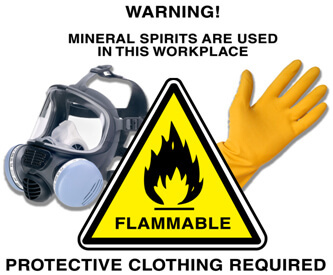 Explosive or flammable chemicals with a flash point of less than 140° F). This would include most solvents, benzene, aromatic hydrocarbons, mineral spirits, toulene, naptha, ketone, alcohols, paint thinner, etc. Heavy metals (lead, mercury or cadmium). This would include contaminated shot blast, oven ash, cleaning solutions and sludge. Cyanide from electroplating or metal treating operations. 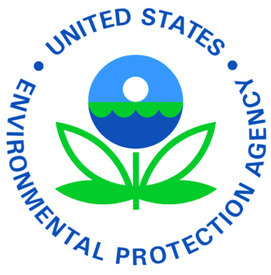 Any other substance that the EPA, Department of Transportation or state regulatory agencies have labeled hazardous or toxic.